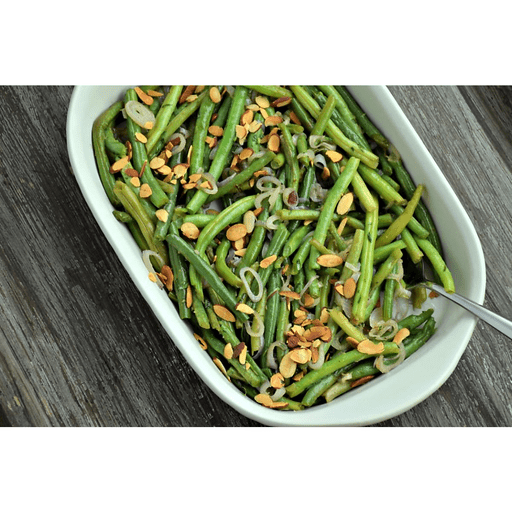 Filled with lots of fresh flavors like tarragon and lemon zest, this side dish will be a stand out next to your holiday turkey or ham. 1. Preheat oven to 350°F. Spread almonds evenly onto a baking sheet and toast in oven for about 8-10 minutes or until fragrant. Remove from oven and set aside. 2. Melt butter in sauté pan over medium high heat. Add shallots and cook, stirring occasionally, until lightly golden, about 3-4 minutes. Remove from pan and set aside. 3. Reduce heat to medium. In now empty pan, add ½ cup water, olive oil, salt and pepper. Add the green beans and toss to coat. Cover pan and cook, stirring occasionally, until beans are bright green and tender-crisp, about 4 minutes. 4. Remove cover and increase heat to high. Cook until the water evaporates and the beans are glazed. Toss with tarragon, lemon zest, almonds and shallots. Serve immediately. Per Serving: Calories 110, Total Fat 8g (Saturated 1.5g, Trans 0g), Cholesterol 5mg, Sodium 230mg, Total Carbohydrate 10g (Dietary Fiber 4g, Sugars 5g), Protein 3g, Vitamin A 15%, Vitamin C 20%, Calcium 6%, Iron 8% *Nutritional values are an approximation. Actual nutritional values may vary due to preparation techniques, variations related to suppliers, regional and seasonal differences, or rounding.